NINJA FOODI – IT’S KITCHEN WIZARDRY! YOUR WORLD IS ABOUT TO BE ROCKED! Over the years, cooking methods have continued to evolve and improve thanks to technology. The buzz about Ninja Foodie cooking method is so loud, that air frying appliances have become a staple in almost every kitchen. These delicious low carb recipes are ideal for Low Carb Keto Diet, High Fat Keto Meals, Ketogenic, and High Fat diets. 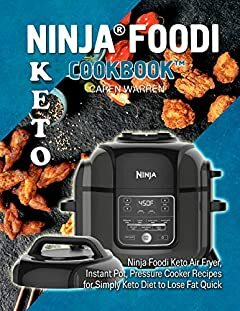 “Keto Ninja Foodi Cookbook: Ninja Foodi Keto Air Fryer, Instant Pot, Pressure Cooker Recipes for Simply Keto Diet to Lose Fat Quick. (ninja foodie cookbook, ninja foodi for beginners)” by Caren Warren is pure goodness in the palm of your hand! easy to prepare keto recipes of Ninja Foodi Air Fryer, Ninja Foodi Instant Pot, Ninja Foodi Pressure Cooker, beautifully laid out with gorgeous photography – making them a joy to create! ketogenic diet recipes that melt your tongue! Lose Fat Quick, Feel incredible, Boost your energy, Satisfy your tooth living your Keto Lifestyle with this low carb keto cookbook. Your Ninja Foodi is ready to impress!